Thousands of you, making millions of classifications, have succeeded at classifying 300,000 images of galaxies in only five months after the launch of the SW-HSC campaign! Well done – what an amazing effort! We’re currently reviewing the lens candidates with the highest scores, and we’re impressed with the quantity and the variety of lenses that have been discovered. One of the best candidates is subject ‘20986142‘, with the unmistakable four image ‘quad’ configuration of a lensed compact source, possibly a faint quasar. 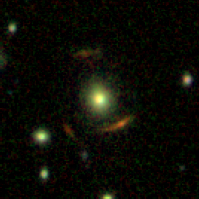 This is also one of the most distant lens galaxies in our sample (we are seeing its light at about half the age of the observable Universe), a useful feature for the study of how galaxies evolve in time. Another impressive lens is subject ‘21000104‘, consisting of two massive galaxies close to each other which, thanks to their combined lensing power, produce a set of multiple images with large angular separation. All of the citizens who inspected this candidate classified it as a lens, making it one of the few systems with a perfect score, and rightly so! Three new SW-HSC promising lens candidates found in the latest SW search. 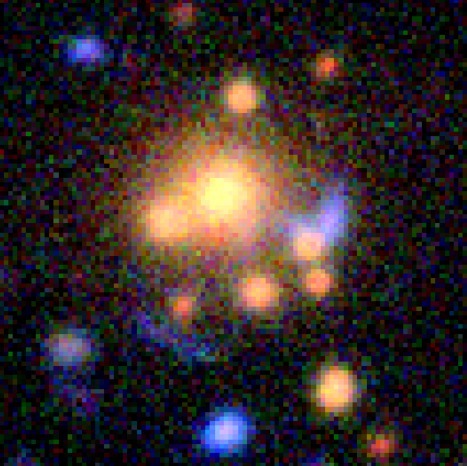 The same image is shown in the top and bottom rows, but with lensing galaxy subtracted in the bottom row. There are also nearly a dozen disk galaxies identified as lenses, like system ‘21067892‘. Not many disk lenses were previously known, making these new discoveries very useful for the study of this particular class of objects, including their masses. We are working on refining the final SW-HSC sample and will post-back with more details soon. Based on our early inspection, we certainly expect that you have discovered more than a hundred new strong lenses! Space Warps is back! A new campaign, launched last Friday in collaboration with Science Friday, is aiming to collect 1 million classifications to discover gravitational lenses among 300,000 images of galaxies from the Hyper Suprime-Cam instrument on the Japanese 8.2m Subaru Telescope, Mauna Kea. Classifications are ongoing, we’re just shy of 900,000, but a few lenses have already been discovered. A very interesting one among these is ‘Subject 21035634‘ (real name and coordinates will be revealed in a scientific paper once the campaign is over), which the Space Warps crowd has ranked with a perfect score of 1 (meaning it’s a highest probability lens candidate)! 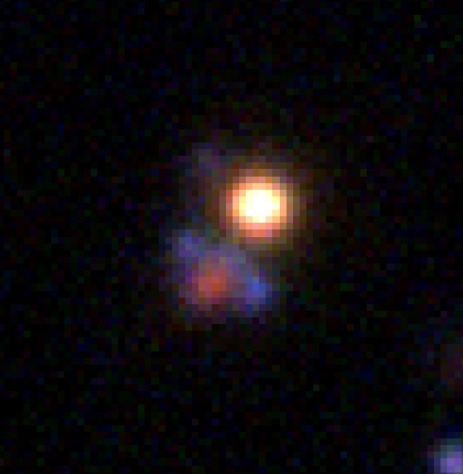 This candidate gravitational lens stands out for its aesthetics, with a nice blue arc seen through an extended envelope of stars from the lens galaxy, as well as its distance: the lens is located between 6 and 7 billion light years away. Finding distant lenses is one of the main goals of this project, and we expect there to be dozens of lenses at an even higher distance than this one. Can you help us reach our 1 million classifications in 1 week goal and help us find more lenses? Visit spacewarps.org – every classification counts! It was flagged first on Space Warps Talk by user @Dolorous_Edd. We’re really pleased to announce that our papers on the first Space Warps gravitational lens search on the Canada France Hawaii Telescope Legacy Survey (CFHTLS) have been accepted by the Monthly Notices of the Royal Astronomical Society, and will appear online and in print next month. In the meantime, you can find the accepted papers at Paper I & Paper II. 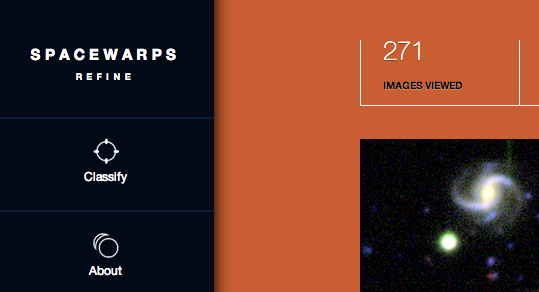 We’ve also resurrected the Space Warps site and are eagerly awaiting your classifications! You’ll be able to look at some CFHTLS images that have been seen before but we think are likely to contain interesting objects that didn’t quite make it into our final sample according to the analysis pipeline we ran while the project was live. Subsequently, Chris Davis, a research student who works with Phil at SLAC, put together an “offline” analysis that considers your classifications slightly differently. This threw up some new candidates that we would like your second opinion on. These may be false positives (i.e. objects that look like lenses but aren’t), difficult candidates (where you all didn’t agree), or genuinely missed candidates (not enough people viewed them). There’s an example of a missed simulated lens below. Check-out the Spotter’s Guide to refresh your memory on real lenses, false positives and artifacts. There are far fewer images this time round so you may find yourself out of subjects quickly. We’ve also prepared a few articles from our home institutes that will come out today (Thursday 24th September) to mark the acceptance – a press release from Anu’s home institute in Tokyo, Kavli IPMU, a Symmetry article (online this afternoon) from SLAC, Phil’s home institute, and an Oxford Science Blog post from my home institute – so watch out for those! We’re hoping that we may get to meet a few new lens spotters as a result of the articles, so please do help out any newbies you spot on Talk if you get the chance! Some of the images you see may already have been discussed on Talk as potential lenses as well, so please do add to those discussions too. The image on the left shows a training image used in Space Warps. We inserted a simulated lens (top right) and this was presented as part of the classification stream. The right panel shows how it was classified by each viewer, the number of views increases from top to bottom. Each kink in the blue line indicates each new classification. Moves to the left indicate those who thought there was no lens here, and moves to the right show those who did. Overall the source stayed roughly 50:50, so the community classification for this object was undecided. A community classified lens candidate would lie to the right of this plot (trajectory crossing the blue dotted line on the right), and an image containing no lens candidate would cross the red dotted line on the left. Similarly, real (non-training/non-simulated) lenses may have been undecided in the CFHTLS search. We are now asking you to view some more images that could contain potential lens candidates that didn’t quite meet our detection threshold in the initial search. Having recovered somewhat from the madness that was BBC Stargazing Live, the SpaceWarps team have been continuing to work through the marvelous data supplied by warp hunters since the relaunch of the project. As we’ve said before, there are lots of good candidates, but much of the attention has continued to be on the object we featured on the program. Observatories have continued to be generous with their time, and the team are particularly excited by this image. It may not look like much, but this is a picture taken with the James Clark Maxwell Telescope’s SCUBA2 camera. This is interesting because it fills a gap in our wavelength coverage of the object, which allows us to continue pinning down exactly what type of galaxy our lens hunters have captured. On a personal note, having spent a lot of my PhD there the JCMT is my favourite telescope, so it’s great to see it getting involved in this follow-up campaign. So how about this new data then? Here’s an example gravitational lens from the VICS82 infrared survey – and here’s PI Jim Geach of the University of Hertfordshire to explain the survey. Jim says: VICS82 stands for “VISTA-CFHT Stripe 82”, and is the largest near-infrared imaging survey of its kind, mapping nearly 200 square degrees of the Sloan Digital Sky Survey ‘Stripe 82’ – a narrow strip of sky that is the deepest part of the SDSS. VICS82 is using two 4-m class telescopes fitted with large-format near-infrared cameras: the Canada-France-Hawaii Telescope (atop Mauna Kea in Hawaii) and the VISTA survey telescope in the Chilean Atacama. Over the last few years, Stripe 82 has received much attention from a wide range of different telescopes, covering the millimetre and radio bands, through the optical and infrared and (soon) high-energy x-rays. Its location along the celestial equator makes the Stripe a great target for facilities in both the northern and southern hemispheres – in fact, it’s shaping up into the first of a new generation of very large and deep extragalactic survey fields. Previously there has been a compromise between survey depth and sky area that has limited the size of the fields we can observe if we want to study the distant Universe (you can go very deep and therefore see very far, but only over very small patches of sky – like the Hubble Deep Field). But with ever-improving sensitivity and mapping capabilities in instrumentation right across the electromagnetic spectrum we’re now able to map much larger areas to much deeper depths than every before. While certainly not as deep as the HDF, VICS82 is the deepest near-infrared survey that exists for the size of the sky it has imaged, and can see normal galaxies out to a redshift of about 1 or so, when the Universe was roughly half its present age. It can see quasars out to much higher redshifts – these objects shine like beacons across the Cosmos. So, one of the main goals of VICS82 is to survey a huge volume of the Universe to detect a mixture of massive and passive (ie, not star-forming) galaxies, and also dusty and actively star-forming galaxies and quasars. While VICS82 uses wavebands that complement the existing SDSS imaging (improving photometric redshifts for example), some of the objects detected by VICS82 are expected to be very faint or even invisible in the current optical imaging of the Stripe, showing up only at the longer wavelengths (1-2 microns) probed by VICS82. We call these systems ‘red’, and they are very important to consider in our census of galaxies if we are to properly piece-together the story of galaxy evolution. With SpaceWarps we hope to identify examples of rare ‘red arcs’ which might be very distant, highly reddened galaxies lensed by a foreground mass like a group or cluster. If these galaxies contain lots of dust, their visible light might be completely extinguished internally, and so would not be detectable at shorter wavelengths, but the infrared photons can more easily escape. If we can find even a few of these systems, then the possibilities for detailed follow-up work are tremendous, since – when armed with a model of the lensing mass – we can really dissect the galaxy, exploring its inner workings in a way that is simply impossible without the benefit of lensing. 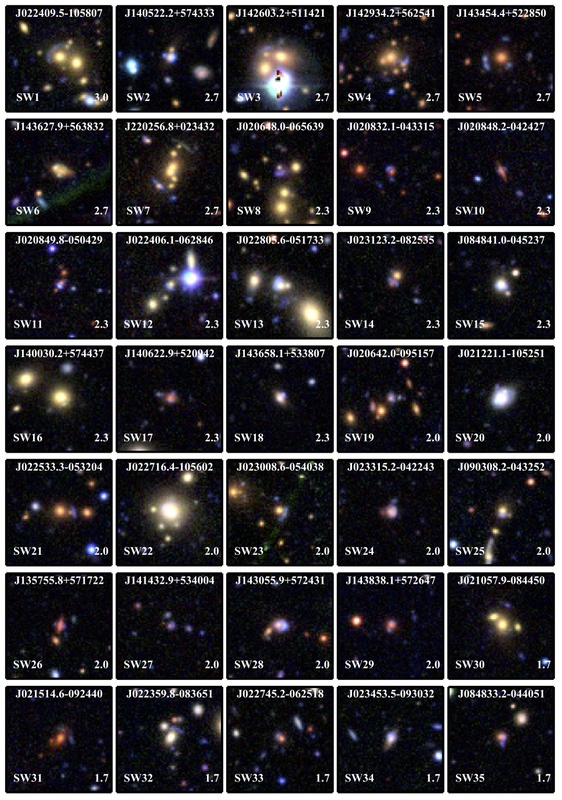 What we’ve done is select about 40,000 images from the survey, that each contain either a possible lens (ie a massive galaxy or group of galaxies), or a possible quasar source. The images are a little fuzzy, because the night sky is so bright in the infrared – this makes it quite difficult for computers to detect the faint lensed features. Sounds like a job for Space Warps! Good hunting, and thanks for all your contributions – see you on Talk! Seasons Greetings from Space Warps: Some Refined Lenses, and a Big Thank You! Well, Space Warps Refine has been running for just over a week, and it’s had a fantastic response from you all. THANK YOU! With over 140,000 classifications of the 3679 images, we have very good data on almost all of them – and some exciting new lens candidates are popping out of the pipeline! 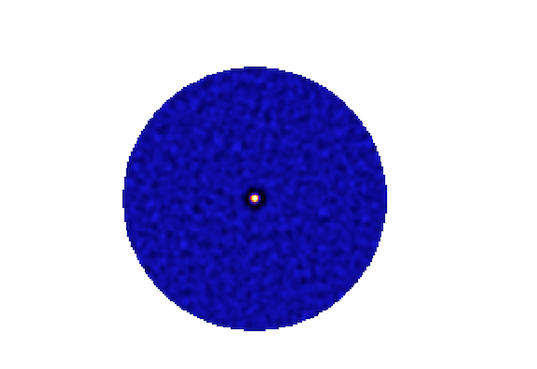 Here’s one: a nice example of a small lensing cluster, with a longish gravitational arc. We think this probably wasn’t picked up by the robotic ArcFinder because it has such low surface brightness, and the field is so crowded. Here’s another good one: a binary lens? The blue arc looks like its composed of three merging images of a small blue background galaxy, strongly lensed by the lower red galaxy. But what’s that yellow object? It’s a little bigger than a star would be, so it’s probably another massive galaxy – and its colour suggests that it’s at a lower redshift than the lens galaxy. If it is in the foreground, then it is lensing both the blue arc, and the red lens! So-called “compound lenses” like these are very interesting: we might be able to learn about the mass of the yellow galaxy as well as the red one. With enough examples of systems like this we might even be able to say something about how fast the Universe is expanding… Tom’s written a paper on this that you might find interesting. New lenses are not the only things turning up from the Refinement analysis: there are a very small number of false positives sneaking through, but as you might expect, they are pretty convincing imposters! Follow the links in the images’ comments feeds to see the problems with this apparent Einstein Ring, and this nice looking bright arc! We’ll leave the images on Space Warps Refine up over the holiday period to give you the chance to classify as many of them as you want, and in the New Year we’ll do the final analysis of their probabilities taking all your votes into account. Just as we had hoped for, it looks very much like the outcome will be a short list of very good lens candidates, ranked by probability. An excellent publishable result! When we have the final list, we’ll be taking it to Talk, and starting the process of capturing, with your help, all your investigations of them, including the zoomed in views that show the lens configurations best, and the models that you have been making. So, it’s been a wonderful first year for Space Warps: a more or less completed first project, and some exciting new lens candidates. Next year, we’ll be back with some new survey data – a new challenge for you. Thanks very much for all your contributions – we hope you all have a very good holiday season!